"Before long I began to understand that showing up, being there, helping in an otherwise helpless situation was made heroic by the same gravity I had sensed when I first stood in that embalming room as a boy—the presence of the dead made the presence of the living more meaningful somehow, as if it involved a basic and intuitively human duty to witness." —from Chapter 1, "How We Come to Be the Ones We Are"
Two of the most authoritative voices on the funeral industry come together here in one volume to discuss the current state of the funeral. 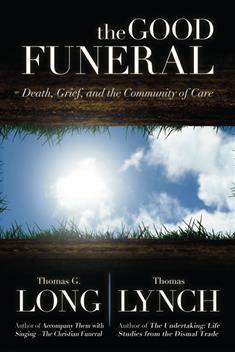 Through their different lenses—one as a preacher and one as a funeral director—Thomas G. Long and Thomas Lynch alternately discuss several challenges facing "the good funeral," including the commercial aspects that have led many to be suspicious of funeral directors, the sometimes tense relationship between pastors and funeral directors, the tendency of modern funerals to exclude the body from the service, and the rapid growth in cremation. The book features forewords from Patrick Lynch, President of the National Funeral Directors Association, and Barbara Brown Taylor, highly praised author and preacher. It is an essential resource for funeral directors, morticians, and pastors, and anyone else with an interest in current funeral practices.